After the 2000 season, a 25-year-old Alex Rodriguez had just finished a historically great season. He hit 41 homers, batted .316/.420/.606, and posted a 158 wRC+ to go along with solid shortstop play on his way to 9.5 WAR. In his first five full seasons, Rodriguez averaged over seven wins per year as he headed toward free agency. He might not quite have been early-career Mike Trout (nobody is), but he had just completed one of the 10 best starts to any career in history. The Rangers won Rodriguez’s services with a 10-year, $252 million contract. In the 18 offseasons since, no other free agent has received a larger contract despite payrolls that have more than doubled during that time. In 2001, the first season of Rodriguez’s deal, the average year-end MLB payroll was $66 million, per data collected from Cot’s Contracts and calculated by Major League Baseball. 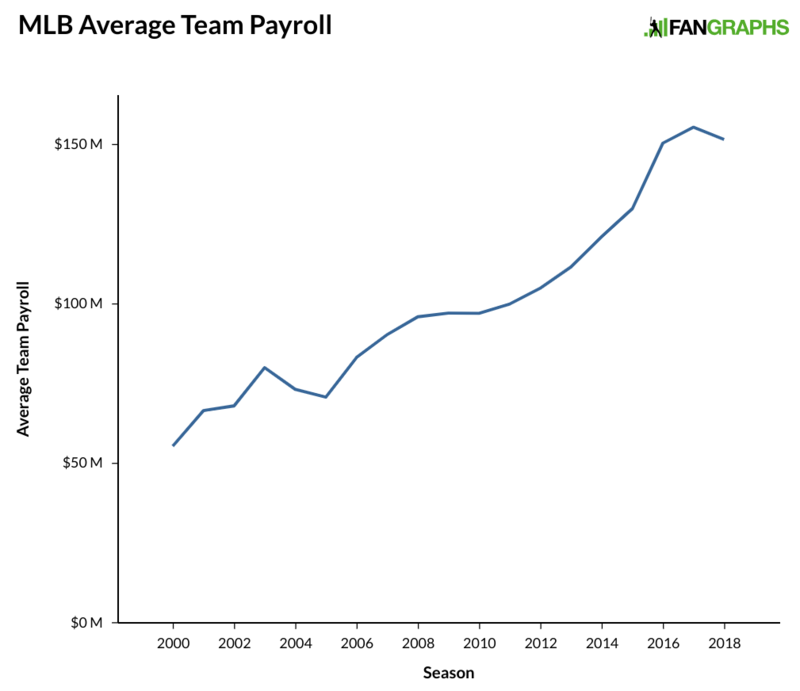 Last season, that figure was $152 million, which was a drop from 2017, when the average payroll was $155 million. For some perspective, here’s how average payrolls have risen since 2000. Generally speaking, salaries have risen pretty steadily over the past two decades. Even with the step back last year, salaries have risen at close to 6% per season starting in 2000 and 5% per season starting in 2001. The growth looks healthy, though it has tended to happen in spurts, with the last few seasons showing no growth at all. There is a discussion to be had about spending as it relates to revenue, but this is not that article. Here, I am more concerned with salary growth as it relates to individual players, particularly those at the top of the pay scale. Average payroll has more than doubled in the past two decades, yet Alex Rodriguez’s contracts remain atop the free agent leaderboard despite occurring in 2000 and 2007. To get a sense of the progression, I looked at the 75 contracts Cot’s has listed as totaling at least $100 million. The first was Kevin Brown‘s $105 million deal ahead of the 1999 season, and we go all the way to Patrick Corbin’s $140 million contract which starts next year. The contracts below aren’t only free agent contracts, as they include contract extensions as well. Here are the top 25. Please note, the “Year” column represents the first season of the deal, not the year in which the contract was signed. Giancarlo Stanton’s deal is the largest by dollar amount, and eight of the biggest 12 contracts were signed in the last five seasons. That shouldn’t be a surprise, as inflation moves prices upward. When we see that Manny Ramirez and Matt Kemp both signed for $160 million, we hear the same number in our head, but when the deals are 11 years apart, we know they aren’t really close to the same thing. Exactly how we should adjust for inflation is an interesting question. If we simply looked at the national rate of inflation, that $252 million contract A-Rod signed would be something like $365 million today. His second contract would total roughly $330 million, and Stanton’s contract would sit at $345 million. An inflation calculator says the equivalent deals signed by Manny Ramirez and Matt Kemp are actually $54 million apart. But it doesn’t really make sense to use national inflation numbers when baseball salaries have risen at a considerably faster rate. As a result, I have attempted to replicate the big contracts over the last couple of decades using baseball salaries as the base for inflation. There is a case to be made that we should be doing this analysis based on revenues, but those numbers are murky when it comes to what should and shouldn’t be included or excluded, and aren’t always readily available. For the purposes of this study, we will give the league the benefit of the doubt that the player’s share of revenue has remained steady at roughly 50%, even though that seems impossible for 2018 as salaries were cut about 2.5%. For player salary purposes, we’ll use the year-end 40-man roster numbers that MLB uses. Next, we have to take a guess at what 2019 payroll will be. Adding 5% seems like too much in the current environment, but with two monster free agent contracts upcoming and a relatively brisk free agent market for starting pitchers thus far, we will go with a 3% increase, which takes us up to $4.7 billion, or an average payroll of $157 million. If salaries remain stagnant again, it will affect the outcomes below a little, but not enormously. To determine any particular contract in 2019 terms, I took the $4.7 billion 2019 projected payroll and divided by MLB payroll in the season a player signed. For example, MLB payroll was roughly $3 billion in 2011, so any contract starting in 2011 was multiplied by 1.57. With all that in mind, here are the biggest $100 million deals in adjusted 2019 terms. Nearly $600 million for Alex Rodriguez probably seems a little wild. Of course, it was a little wild at the time, given that it was twice as high as the biggest contract signed before that offseason, and 58% higher than the one Manny Ramirez signed that same offseason. That contract also would have been worth it if the Yankees hadn’t given in to Rodriguez and signed him after he opted out following the 2007 season. From 2001-2010, the years of the original contract, A-Rod put up 70 WAR, more than fulfilling his end of the bargain. When we see these past contracts in today’s terms, we see that $300 million for Manny Machado and Bryce Harper isn’t A-Rod or Stanton money, but is instead Mark Teixeira, Joe Mauer, and Robinson Cano money. In one sense, Harper and Machado might both get the largest contracts in history, but practically, this analysis shows they are likely to be in the back half of the top 10. For one perspective, here are the $100 million contracts by average annual value. Min. Value of $100 M.
*The year 2000 was used for Kevin Brown as data from 1999 might not have been consistent. That $30 million per year isn’t really a figure teams have been scared of in the past. Players are still signing large contracts, but they have been limiting the number of those elite-level contracts they give out. There are a lot of possible reasons for this salary suppression, including extensions for young players that have kept them from free agency, a luxury/competitive balance tax system that has acted as a cap and failed to keep up with payroll and effectively worked as a salary cap, PED testing that has changed aging curves, and increased pressure from other owners to keep salaries down. So where is the money going? Several years ago, we could argue it was either going to the players above or perhaps to mid-tier free agents, but given the stagnation of salaries the last few years and the massive profits in the sport, it’s pretty clear where that money is going now. We hoped you liked reading What Alex Rodriguez’s Contract Would Look Like Today by Craig Edwards! I believe the Stanton deal included a couple of arb years — should an adjustment be made to the AAV to reflect that? Also, presumably the more backloaded a contract is, the more the total would be (time value of money), would it make much difference if you computed a PV for each deal when it happened? The more backloaded, the lower the total money on the contract. $150 today is worth more than $50 today and $100 tomorrow, because I could invest the extra $100 today and get $105 (or just $100 plus my ROI) tomorrow, to have $155. Isn’t that backwards? Lets say you were offered a 1y/$10M contract for the 2019 season. Lets assuming that the money is deferred with no interest until 2029 and then it is paid out in $1M installments. This is a really back-loaded deal. That same value on a cash-upfront basis would be something around $4M. The more back-loaded a deal is, the “bigger” the total contract $$ are, but not necessarily more valuable than one with more money up-front without knowing all of the details. At its best, Fangraphs writing is objective, analytical, and data-driven. At the other end of the spectrum are narrative-driven pieces that seek to advance an agenda, merits be damned. The off-hand comments about 1-year payroll changes and it being “pretty clear where that money is going now” fall pretty clearly into the latter bucket from my perspective. As echoed elsewhere in the comments, it’s a terrible end to the piece. How about the fact that MLB payrolls were up 45% between 2012 and 2018, inclusive of the 2-3% decline this year? (and if that’s too endpoint-sensitive for you, take it back a little further and see that 2018 payrolls are up almost 115% since 2005). I’m not aware of another profession where the lack of perfect linearity in comp increases is clear evidence of malfeasance. It would seemingly also be worth mentioning by the author that over this same period of ~45% pay increases for players, in-person attendance is down ~7%. Obviously this doesn’t reflect the full picture of revenue, much less profit (ticket prices have gone up and TV payments are an important revenue stream – more on that in a moment) but it doesn’t speak to a business model without any cracks in it. Note also that the stated comp figures don’t include ancillary benefits both small (e.g., better clubhouse amenities, travel arrangements, and the like – the dollars may not be massive, but clearly they’re valuable to the players given their apparent choice to focus on them in the last collective bargaining agreement) and large (the rise of player options, which won’t be reflected in current-year payroll, but are of enormous value to the option holder). 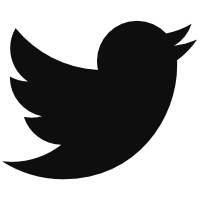 Tying back briefly to the media point – it’s well-worn at this point that consumption habits are changing. TV ratings are falling precipitously – and even if live sports to date has been somewhat better insulated, Disney is beset by worries about what will happen with ESPN affiliate fees; there’s ongoing talk about whether over-the-top rights revert to the clubs; baseball serves a much older demo than the NBA and is perhaps more at risk of structural generational change – etc, etc, etc. All of this can impact how an owner might think about long-term, fully guaranteed liabilities. None of it is examined here. Edwards has seemingly made up his mind, and facts won’t stand in the way of that conclusion. As noted elsewhere, Fangraphs went down this pointless rabbit hole last year. I had hoped this winter would be different. Especially in light of the fact that with a year of hindsight, there seem to be very, very few contracts that were given out last season that look terribly unfair to the players/advantageous to the clubs.